For many of us, the search for a Holy Grail mascara seems like an eternal quest. We seek out every new product launch, hoping for better results than the last… but, you can't trust the ads because the models and celebrities are often wearing false eyelashes! While a great mascara will help A LOT, the secret to great lashes goes much deeper (or should we say longer?) than that. Often-overlooked details, such as how you handle your mascara wand and how you take care of your natural lash hairs, can make all the difference. With that in mind, we're unlocking our vault of mascara secrets to give you the best-looking lashes of your life. Pair these tips with the best mascaras and you'll get the luscious lashes you've been longing for. DO build mascara in layers. Start with two or three strokes on one eye and then go to the other and do the same, then back to the other eye…. Rotating like that a few times will help you build va-va-voom lashes! Keep in mind that it takes some trial and error to figure out the perfect amount. If you overdo it, you can end up with clumpy, spidery lashes, and also increase the likelihood of flaking, chipping, or smearing. That's OK—lesson learned. Next time, try one less coat. DO the wiggle technique for thick, full lashes. It's as simple as it sounds: Wiggle the brush back and forth at the roots of the lashes to saturate the mascara at the base, then pull upward to the tips. This creates the appearance of density at the lash line and adds length without a clumpy mess. DO hang on to your favorite mascara brush before tossing out your old mascara. A cleaned up mascara wand (or spoolie brush) can be combed through lashes to remove excess mascara or clumps, as well as to help separate the lashes. It's also a great tool for refreshing lashes before applying another coat of mascara and heading out into the evening (add a light sprinkle of water to the brush and wiggle across lashes to soften the dried mascara, then apply your next coat). DO replace your mascara three to six months after opening. This is important, not only from a hygiene perspective, but also because older mascara formulas begin to flake, clump, or smear. Not a good look on anyone. DO switch to less emollient eye creams or concealers if your mascara always smears. If you consistently have this issue no matter what kind of mascara you try, there is a good chance your eye-area products may be a contributing factor. Rich, emollient moisturizers, eye creams, or creamy concealers can cause mascara to break down and smear (even waterproof versions, which hold up well against water, but not oils). Consider switching to a lighter (less greasy) version of your eye-area products to see if that helps stop the smudging and smearing. DO use makeup remover to take off mascara and keep your lashes in good shape. Even if you're using a good cleanser, there's still going to be a considerable amount of tugging and pulling at the lashes to get all your mascara off. Doing that day after day will cause skin to sag and also will pull at delicate lashes, potentially increasing fall out. Wash your face first and get off as much eye makeup as you can without pulling, and then take the last traces off with a great makeup remover. DON'T pump the wand. All that does is force in more air, which causes the formula to go bad more quickly. DON'T add water or other fluids to thin out or remoisten your mascara. Doing so can create a breeding ground for the kinds of substances you want to keep away from your precious peepers. DON'T forget the lower eyelashes. 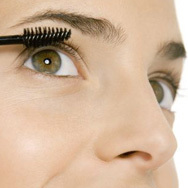 Hold the mascara wand perpendicular to your eye and move it back and forth over the lower lashes. Then use a clean mascara wand to remove any excess. DON'T use waterproof mascaras on a daily basis. Removing waterproof mascara requires a good deal of tugging and wiping around the eye area, and doing that day after day will cause the skin to sag and the lashes to fall out. Of course, there are occasions when waterproof mascara is called for (e.g., emotional events), but think twice about daily use. DON'T curl your lashes after applying mascara. If you use an eyelash curler, use it before you apply mascara. Curling your lashes after you've put on mascara can pull hairs out and lead to unnatural-looking, severely bent lashes that clump.